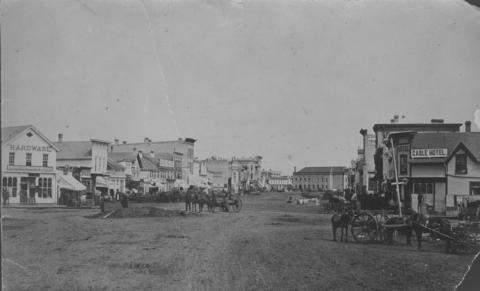 City of Winnipeg businesses shown in photograph: George Ashdown Hardware, Davis House, Symonds Furrier, Cable Hotel, J. Lister, Outfitter, Rossin House, the Blue Store, and the first City Hall is shown in background. Date of photograph is uncertain, [188-? ].